For the last few years, we’ve published monthly reports about small-to-medium size rescue groups doing their utmost to deal with the crisis. Which is why it brings us great pleasure to announce funding for an innovative rescue start-up that seeks to change the future. hopeful message to UCSD students. 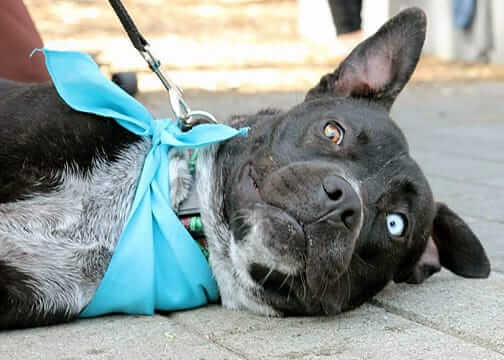 Founded by Margaret Choi, Furry Foster's goal is to put a stop to the practice of euthanizing homeless pets, which currently number in the many millions every year. Through ardent educational campaigns, they aim to enlist legions of new fosterers. By significantly increasing the number of people willing to foster, stress on traditional shelters can be alleviated and untold numbers of companion animals saved from an untimely fate. According to their research, every year approximately 17 million Americans consider adopting a dog or cat but don’t follow through. Reaching out to just a small percentage of this group could result in a massive decrease in the needless killing of pets whose only crime is not having a home. Established at the end of 2011, Furry Foster has already achieved significant steps toward their goal. Through their online efforts, they now maintain the largest online database of foster pets available in San Diego. Working with a newly established network of local rescues, they’ve streamlined the temporary-adoption process by creating a universal foster application, making it easier than ever before for people to find a perfect match. Unlike large web presences, such as Petfinder or Adopt-a-Pet, Furry Foster provides much-needed services, too. Their volunteers personally connect with each potential fosterer to review their application. The flip side of this service is that each candidate is pre-screened, meaning less work for the rescues in their network. Thanks to their groundbreaking model, fifty animals were fostered in 2012 who would otherwise have languished in shelters. That number doubled in 2013. 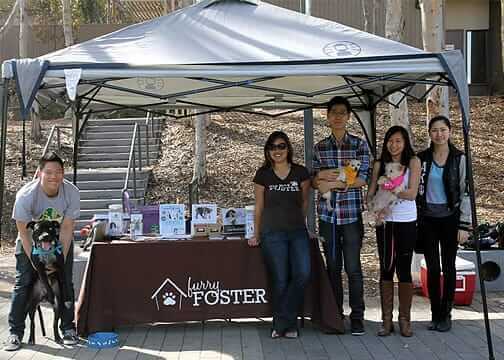 Our grant was used to fund another of Furry Foster's initiatives … on-campus events co-hosted by student organizations to promote fostering and volunteerism by young adults. Our financial assistance subsidized an event on the campuses of the University of California – San Diego in association with the pre-business fraternity Alpha Kappa Psi. While on campus, workers did not waste any time, recruiting a significant number of new volunteers and folks interested in opening their homes - and their hearts - to foster animals. Bodhi, a canine ‘ambassador’, takes a well-deserved break. Joining them in their activities were two canine ‘ambassadors’. One is named Bodhi, a three-year-old, Pitbull-Lab mix who was rehabilitating from a broken leg and seeking a foster family. Also in attendance was Choi’s own foster pup, a five-year-old Chihuahua mix named Sunny, who has since been adopted. Their on-campus activities attracted a bumper crop of new recruits to their cause - 46 new event volunteers and 20 potential foster guardians! Two students each fostered two kittens and another fostered a dog. 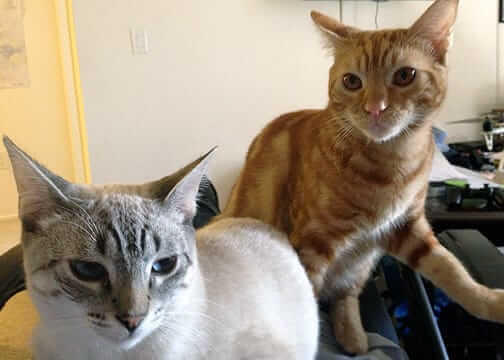 Thanks to the event, Buster and Hobbes found their forever home. The true measure of their success is in attitudinal changes, opening minds to the idea of becoming a foster parent to a homeless dog or cat. Before leaving campus, they also gave an inspirational presentation to 40 students about the vital role of animal rescues. That’s 40 people who will adopt new attitudes about fostering that they will likely remember for the rest of their lives, sharing this important message with countless other people. It’s easy to see how a small rescue can affect real change in a few short years. Not content to rest on their laurels, Furry Foster has already begun planning outreach to other collegiate organizations for the upcoming spring and fall semesters. With valuable feedback from UCSD students, they are also developing brochures, flyers, and event materials targeted at college and graduate-school students, improving the chances that they’ll be even more successful at future recruiting events. If you or someone you know lives in or near San Diego and would be interested in helping shape the future of fostering in America, we encourage you to contact Furry Foster (furryfoster.com). You never know … you could end up finding your new best friend! Dr. Jane’s Foundation has provided funding to animal rescue groups all over America since 2007. Our non-profit wing could not have achieved what it has without the continued patronage of our customers and the contributions of individual donors. On behalf of the animals who are now living in new forever homes thanks to Furry Foster, we thank you for caring enough to make a difference. Thank you Life's Abundance & Dr. Jane's HealthyPetNet Foundation for your support, we couldn't do it without you!